This black truffle is like gold in the kitchen. Mushrooms--that edible fungus that is so versatile and yet adds such a distinctive flavor to any dish it accompanies. Ancient Egyptian pharaohs loved mushrooms so much that they made a decree that the fungus was only suitable for royalty and off limits to commoners--all so that they could have more to themselves! Other ancient civilizations believed that eating mushrooms gave you special powers like immortality or superhuman strength. Just because you know better. . .doesn't mean that you can't enjoy food of ancient royalty. Mushrooms add distinctive flavor to any dish but in addition they are widely used in part because they are versatile. You can serve them alone, serve them in a dish, marinate them, stuff them and bake them. . .the list could literally go on and on. Don't forget about truffles either. Considered "food gold" of the culinary world, a truffle is no ordinary mushroom. 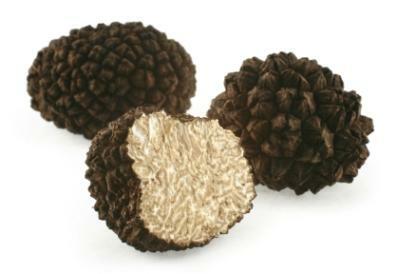 More importantly though, you can learn what a truffle is, how to select the best truffles and what to use truffles for! If you thought mushrooms were limited to sticking on top of salad or pizza--think again. Truffles and mushrooms can often define a dish, if not improve it. In fact, the better a chef uses fungus--the more he or she is noted for it. You too can be a culinary genius and learn how to work with this fungal delicacy that is such a popular food in so many cultures. Learn not only how to handle mushrooms properly but also how to marinate, bake or choose the best varieties. You don't have to all there is to know about truffles and mushrooms to be an excellent gourmet chef--but why wouldn't you want to?